I've been thinking about the constant tug-of-war between tradition and modernity in our Craft. It's an interesting issue that continues to arise as the modern world outside the lodge and the traditions within the lodge either clash, merge, become accepted practice, or exist yet are ignored. Case in point, candles. At the beginning of speculative masonry, lodges used candles as the lesser lights. This was obviously out of necessity. The only way one could light a room effectively was using candles as the long lasting and practical Edison incandescent light bulbs would not be invented until the late 1870's. Candles were the thing to use, it was just that simple. As with all modern advances, the light bulb began to be adopted en masse as Edison and several competing inventors changed the way we viewed light, the night, and time. Of course, this modern advance finally found its way into Masonic lodges. I haven't found any source material on when most Masonic lodges in my state switched from candles to incandescent bulbs but it must have been very nearly after when the incandescent bulb was invented and mass produced from age of the lamps I have seen. I can't be sure why bulbs were chosen but I wish to speculate. I believe the reason was to save time. If you've ever seen a lodge with candles and not bulbs, you have probably noticed the biggest difference when lighting the lesser lights. The candle route takes time, at least two minutes for the Senior Deacon to go from candelabrum to candelabrum while a lamp takes, well, a second. Flick. Now the lesser lights are on. In this case, switching from our old way to light the lesser lights to this new way has not improved the lodge experience. In fact, I'm going to go further and say that the bulbs have done nothing but to remove an important symbol from our lodge. The lodge visits I have attended that employ candles change me somehow. Both methods of light come from the energy of the sun but only with candles do I sense kinetic energy. Candles, with their dancing flames, placing light in seemingly random sections of the Lodge Hall, changes my experience. The candles encourage action, sharpening my mind in a way a light bulb never could. In fact, I would say, I put no thought into the lesser lights when a lamp is used. None. They are just a perfunctory step to opening and closing. Tradition and modernity can work together. Lodges can and should have lodge websites. If a lodge wants an organist but can't find one, using a prerecorded track may be okay. These tools allow lodges to accept a changing world without losing everything that Masonry should keep. Modernity should not force its way in, disrupting what is strictly not its purpose. I can imagine that at some point, a lodge will attempt to use a Kindle, its screen set to "Always On", as a representation of the Holy Bible. I suspect, that some brothers will attempt to record the ritual and have candidates watch a screen, thus, losing that important connection of ritual to self-transformation. As with all things, we must take care not to lose our traditions. We must always balance why we do things with what we can do after advances in technology take hold. I do believe that we can create a balance, we need only be cognizant and vigilant at every meeting. What are your thoughts? How do we effectively protect our traditions and accept helpful technological advances into our lodges? Leave a comment below. 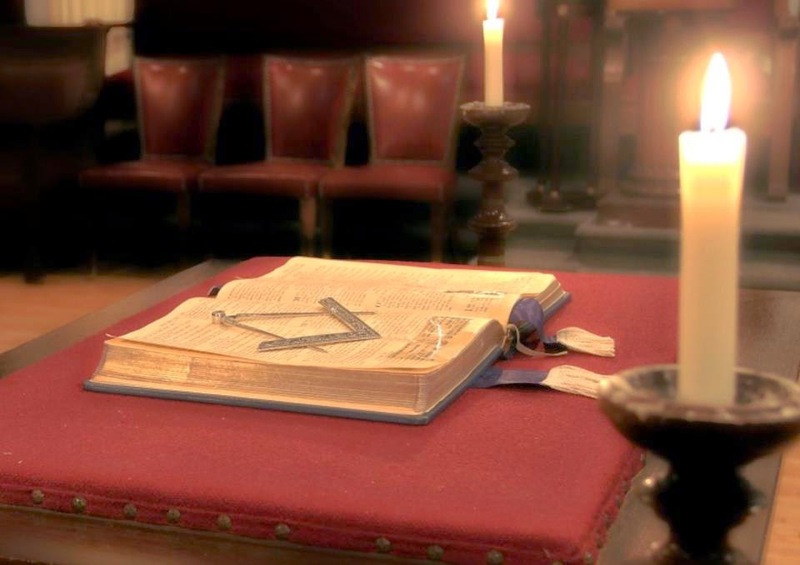 In English Freemasonry, the candles/lamps are lit by the Tyler before the meeting begins and extinguished after the meeting ends, except for the Third Degree, where the Wardens' lights are extinguished before the degree begins. All the temples in Freemasons Hall have oil-reservoir candles rather than lights. The temples in the Harrow Masonic Centre have lightbulbs. As for using technology in Masonry: at one point our usual brother who performed the reading over the grave in the Third Degree was absent. I had the text on my iPhone, and changing the screen to white text on a black background enabled me to read it while perambulating the grave without disturbing the darkness. I have put the first, third, and installation rituals on my iPad for ease of prompting (now that I'm IPM). So technology needs to be embraced where appropriate and helpful. The candle route takes time, at least two minutes for the Senior Deacon to go from candelabrum to candelabrum while a lamp takes, well, a second. Well, that is correct for Lodges where the candles are spaced around the Lodge. There are Lodges in which the three candles are all on one triangular stand kept near the altar, so it takes only about 20 seconds total to light them all. In others, the SD has nothing to do with lighting or extinguishing the lesser lights' representations - they are lit by the three principle officers in turn at the direction of the Marshal, with a small bit of ceremony ... even though they are electric lights. It seems, recently, that there are more and more bloggers who are forgetting that not everything in Masonry is done the same in every jurisdiction, and seem to take their own jurisdiction as a representative sample. Interesting post and something to think about. MP makes a good point, albeit a bit too harshly, that every jurisdiction accomplishes the lighting in their own way, so it may be worthwhile to remind readers which jurisdiction you are referring to when critiquing ritual. Apologies to MP. On a second read, your comment is not harsh at all and on point. During the past year that I have had the honor of serving as Senior Deacon of my Lodge, I have reflected on the opening ritual. At first it felt awkward: I was keenly aware that during those few moments, I had the eyes of the entire Lodge on me as I readied the Altar for a Stated Communication. They watched as I nervously fought with stubborn lighters, uncooperative candle wicks, and over-zealous ceiling fans; such times made me yearn for the convenience of flipping a switch. But I am glad we continue the tradition of using candles. What helped me to put this part of the opening in perspective was a challenge I made to myself last year: to learn the first lecture of each of the three degrees. I remembered the way the lecture refers to a new candidate brought to light and discovering for the first time the Three Great Lights of Masonry illuminated by the light of the Three Lesser. In this way, we are reminded that the Altar is the primary focus of the Lodge, not the guy in a funny hat sitting in the East. It is the Three Great Lights that should form the foundation of everything we do in Lodge, and represent the ultimate goal of every Mason's journey for Masonic Light. Understanding the symbolism of the lights is reflected in how I perform the opening ritual, too: I now make lighting the candles into its own ritual by squaring my corners, always approaching the candle stanchions at right angles from the Altar, never walking between the candle and Altar, and always lighting them with my back to the North or South, never the East or West. I'm not trying to emulate military crispness, but knowing that for a few moments the Lodge is watching as the Altar is prepared for the meeting, I try to maintain a respectful reverence during this portion of the opening, reflecting the 'perfect points of my entrance'. I'm glad our Lodge continues the tradition of the lighting of candles at opening. It may take two minutes, but that's two minutes in which every Brother can align his focus to the Great Lights -- and hopefully remember to likewise align his actions throughout the meeting. I am a FC mason after my EA degree they switched to bulbs. Which have been standing since September. I still find purpose with the bulbs due to the glow they give, via the symbolism. Aren't you merely arguing an unnecessary point? Does it matter what is done everywhere? Should my writing be so general as to please everyone but lose all meaning? Of course, these are my perspectives from my jurisdiction. The general theme of this piece is what role does technological advancement have in our Craft. Years ago (1980s) there was a FidoNet site that used ASCII art to describe the positions of the Lesser Lights around (about?) the altar for each state. It asked "Which state are you in if the Lesser Lights are positioned like his around the altar? Ans: Oregon, North Carolina, ...? There were other arrangements. It was a fascinating subject. Perhaps Brothers from other states can illustrate the arrangement of the Lesser Lights in the states that they know about. I'd love to get that information again! The posting program removed spaces, rendering the post useless, unless you have a vivid imagination.